Jon Solomon reminds me why I miss him so. Once again, there’s the woefully immature image of stupidity. 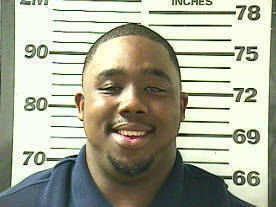 Look at Nick Fairley, arrested for the second time in a month and grinning in his mug shot like he sacked Aaron Murray. Maybe Trooper was on hand at his release to high-five him. Sun, fun and the SEC meetings this week. Here’s a look at the agenda. And Spurdog intends to be divisive. There’s a job opening at Arkansas. And you don’t have to sleep with anybody to be a candidate. Here’s Phil Steele’s returning lettermen chart. Georgia just squeaks into the top quarter. Nick Saban’s coaching tree isn’t as impressive as you might expect. It’s not bad, though. Urban Meyer gets a message from a recruit. Gus Malzahn breaks down Alabama’s defense. Jones and Rambo make Steele’s preseason All-American first team; Jenkins is on second team. … it’s clear that the SEC has dominated college football for the last several years, and a lot of that has been due to their outstanding defenses. Alabama and LSU’s talent-laden squads last year were, of course, Exhibit A. Yet almost all of the rest of college football has been paced by offensive juggernauts like Oregon, Stanford, Oklahoma State, and so on. Obviously whether the SEC’s defense-led dominance can continue is really the most pertinent question in all of college football in terms of deciding who will be the next champion. But the complexion of the SEC itself has changed with the addition of Missouri and Texas A&M, two spread teams whose coaches have had lots of success on offense in the past, along with the up-tempo spread offense new coach Hugh Freeze is bringing to Ole Miss. All of those teams have weaknesses — A&M appears to be the most talented, but we don’t know if they have a quarterback — so I’d be shocked if any of them actually won the SEC over the favorites. But it will be fascinating to see what kind of success, if any, they have this fall. And it will be even more fascinating to decipher whether that success or failure portends any changes, one way or the other, for the rest of college football. I think that’s exactly right. It’s a variation of the old debate about how Boise State would fare if it played an SEC full season schedule. Obviously, Missouri and TAMU played in a tougher conference than the Mountain West, but this clash of schemes should be fascinating to watch unfold. I’m really looking forward to it. Honor our fallen troops… and don’t forget to pick up a six pack while you’re out. Ah, America, you can commercialize anything. I think I’ve read too much about conference realignment lately. Anyway, to those who serve, much thanks.